Two layers of cloth exchange places in this double weave structure. 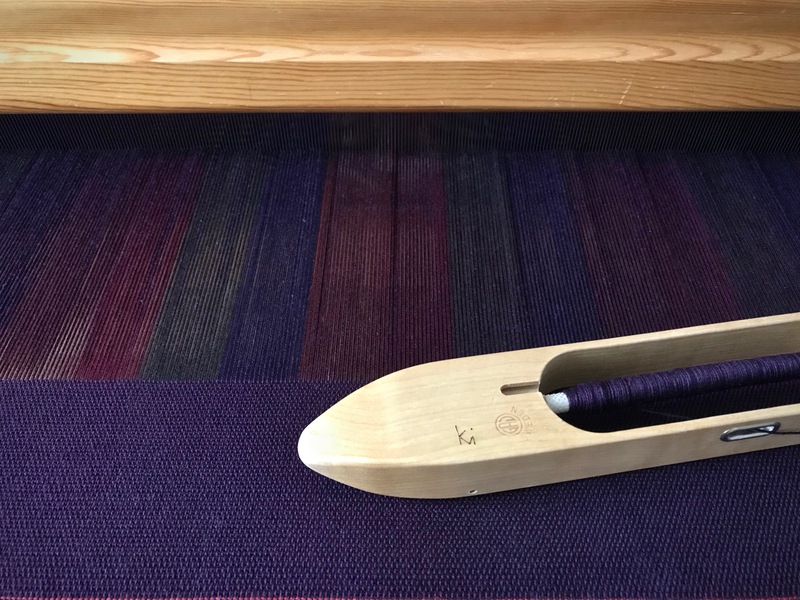 One layer of warp is solid deep plum. The other layer has stripes of bold colors. Clean lines occur where the layers switch places. 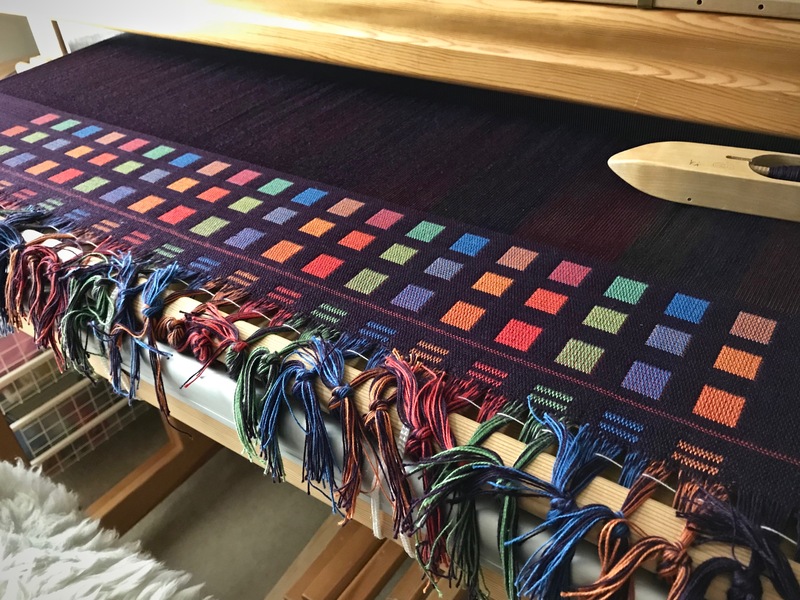 So, with deep plum weft alternating with orange, blue, green, and red weft, we get a message written in clearly-defined blocks: Be invigorated with vibrant color! Dark plum weft alternates with the blue weft. 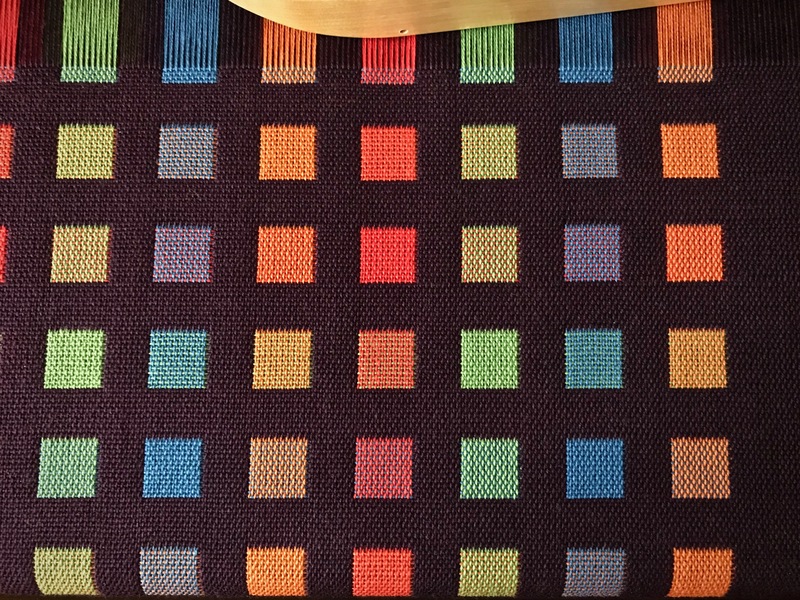 The reverse side of the fabric has dark plum squares in long vertical color stripes. 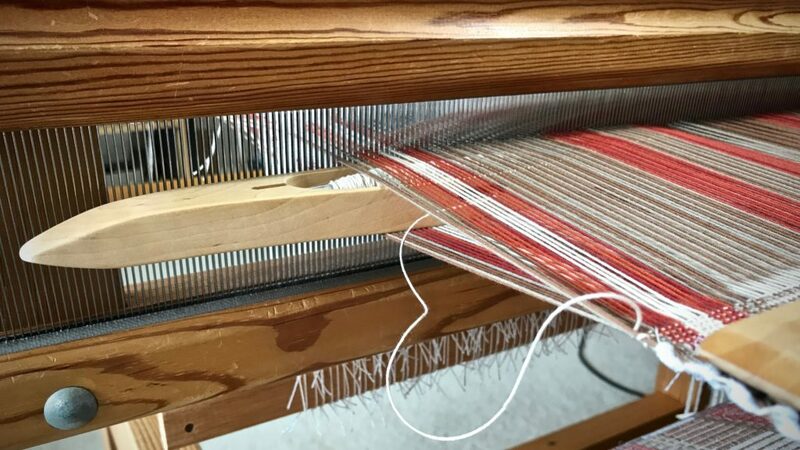 Colors of the warp stripes are used as colors for the weft stripes. 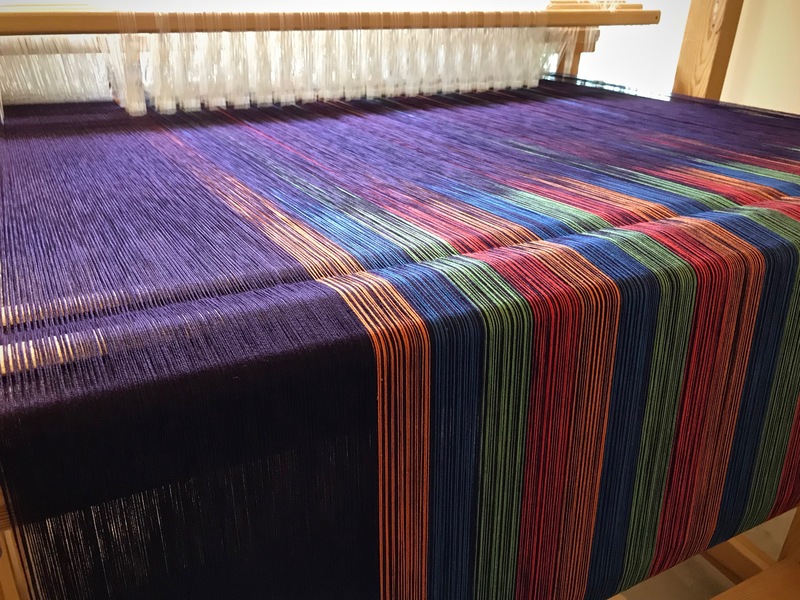 As a result, you can see the “pure” colors in a diagonal line–orange, blue, green, red–where the warp and weft colors are the same. 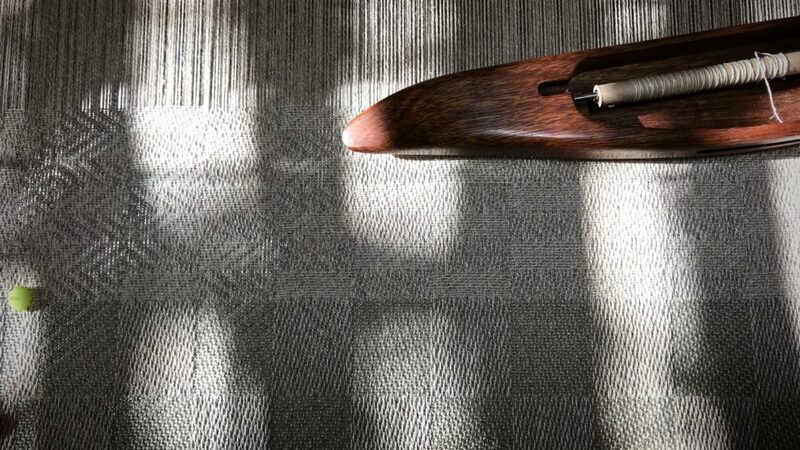 Variance in the blocks of colors gives the cloth a dynamic appearance. 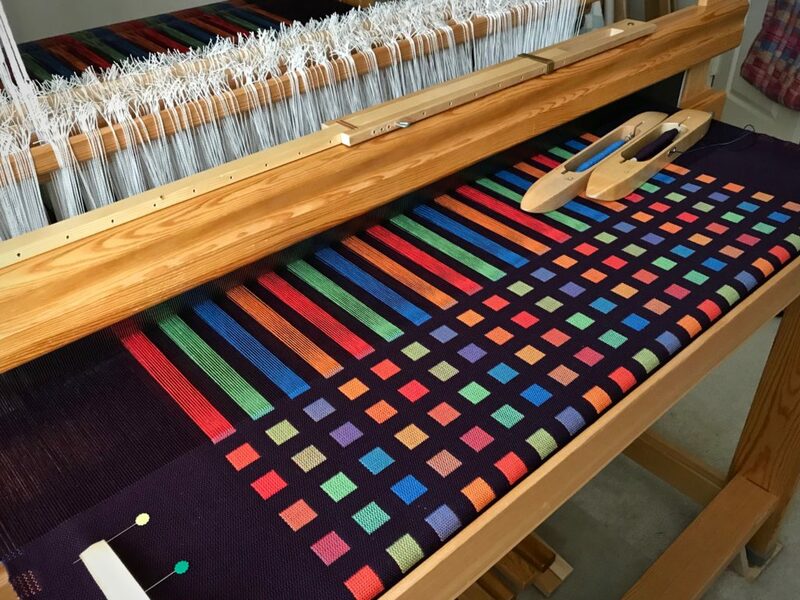 Not including the dark plum background, there are sixteen different colors of blocks as a result of the four colors being used as warp and weft. Message. We have a message from heaven. When Jesus came to earth, he not only brought the message, he was the message. Not that we should try to be good like him. Nor that we are already good enough. But that he, the direct link to heaven, would suffer the consequences for all our misdeeds. And rise again. He willingly switched places with us—the great heaven and earth exchange. This good message brings hope and grace to all of us who live on this earthly layer. Thanks to our Grand Weaver’s faithful love, we are woven into a vibrant-color existence through faith, on this layer and the next. May you see your surroundings in living color. This is terribly interesting. The colors are so delicate. Hi Meg, The contrast between the deep plum and the other colors has a surprising effect. Working with colors never grows old! I am so pleased I discovered your blog. Hi Chris, Doubleweave is fascinating! 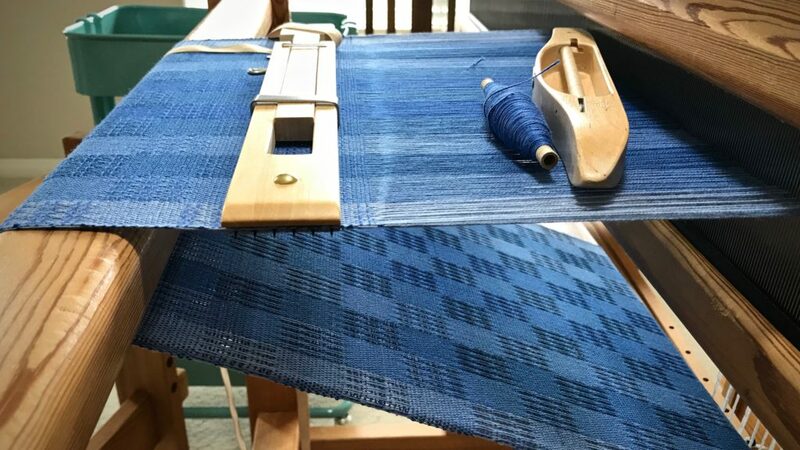 This project stretches me—literally, side to side—making it a delightful challenge to weave. I’m delighted you found your way here! This is just beautiful! And timely. I am currently trying to design a similar doubleweave windows draft for a throw and have come across 2 sources that explain the block design differently. I have been trying to work this out in my head, one vs the other, in my planning process and how to apply it. I confuse myself and have had to keep setting it aside and studying it again later. Seeing this post of yours, I just now realized that you have been posting about this same block design all along and your pictures are now helping me work through it. I am planning a gray background with 10-11 shades of blues, greens, purples in the “windows” for the front. I may vary the heights and widths of the windows throughout the throw…haven’t progressed to that decision yet. My first source for this project is in the book Loom Controlled Double Weave by Paul R. O’Connor, on pp. 42-43. The two may actually be the same thing, just explained differently, so I was having a little difficulty figuring it out in my head. In the second, they are using Dark/Light instead of color letters. If I use gray for both the D and L in Block A, I’m thinking it would be the same as O’Connor’s threading. If I used the second threading, and used gray as D and my colors as L throughout, I think it would only change the appearance of the back. Am I right? 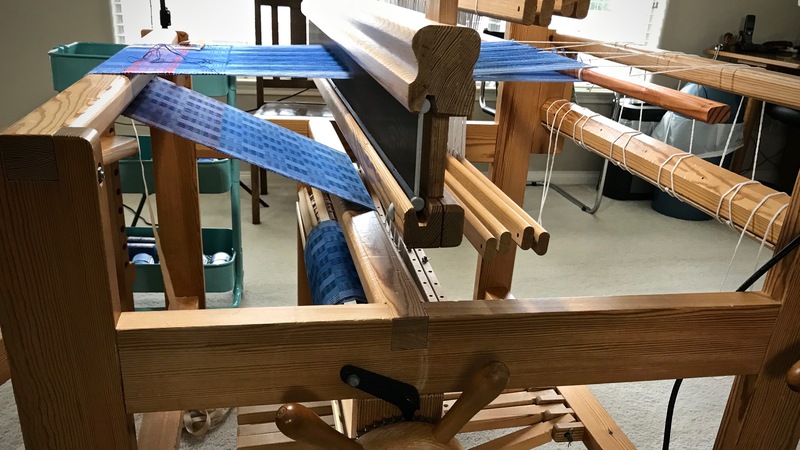 If I want gray to predominate on both sides, I think I just follow O’Connor’s threading, but I think the second source (using D/L) shows the tie-up in conjunction with the treadling and would be more helpful in setting up my loom. I went back through your previous posts about your throw and it appears you used the second approach, the D/L threading in both blocks A and B. I would really like to know what the back of yours looks like, but I still think I want to follow the O’Connor threading. It has been incredibly helpful looking back at your posts at this point in my design process! I feel like a light went on and suddenly it is making sense to me. Hi Janet, I haven’t studied doubleweave like you have. The draft I’m using is similar to the one in the arizona.edu file. I don’t have the O’Connor book to reference. The draft I am using is from The Big Book of Weaving, by Laila Lundell, p. 176, if you want to compare it. I wound the warp with 2 ends–plum, plum; and plum, other color. The threading alternates the plum with the other color in the blocks with squares. I’ll post a picture of the back in a little bit. It’s great when a light comes on like that! Hooray! Janet, Here’s a picture of the back side of the fabric! Karen, thank you for the view of the back! I think I understand the difference in the 2 threadings now. 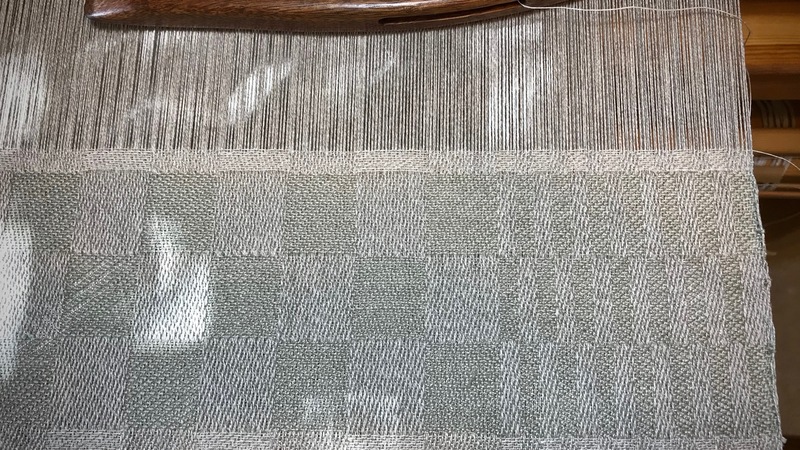 I also pulled out another book I have (and forgot to look at–head slap), Doubleweave by Jennifer Moore), and found an example done using the O’Connor threading that also showed how the back looks in that case. When I first started my comment above, it was going to be asking you a lot of questions to help me make sense of it all. As I typed, that light kept getting brighter, and I answered most of my own questions before they even got typed, so I ended up with a completely different comment than when I started. So, without even knowing it, you enlightened me! Sorry, I do tend to run on when I get wound up…. Don’t mistake me for someone that knows what I’m doing. I think I am more of a technician (& perfectionist) than a creative artist, so I have to understand how things work (and then modify them). I do it when I sew also. Unfortunately, it means I spend more time planning (or “studying”) my projects than actually doing them. I would probably learn more if I just dove in and made things, but I guess I’m not made that way. I have put a request in to the library for the Lundell book, and I imagine I will end up buying it. As a technician, I am also a collector of resources and tools. Love your blog! You are an inspiration. Janet, There are many different learning styles. It’s great that you understand how you are wired! I think I’m also a technician to some degree. I enjoy systems and knowing how something works, and being able to alter that, too. But I’m also finding that I learn a lot by doing, even when I don’t understand. My mistakes — like the several I’ve made with this project — take me to greater understanding and experience. Learning is a lifelong pursuit. I’m glad about that! Love those colors, Karen! The purple becomes a neutral background. Hi D’Anne, I never would have thought of purple being a neutral, but you’re right. It’s almost like a deeply colored black that sets off the other colors. A startling surprise greeted me when I sat down at the loom yesterday afternoon! The sun was shining through the window and sparkles of light were dancing on the loom. 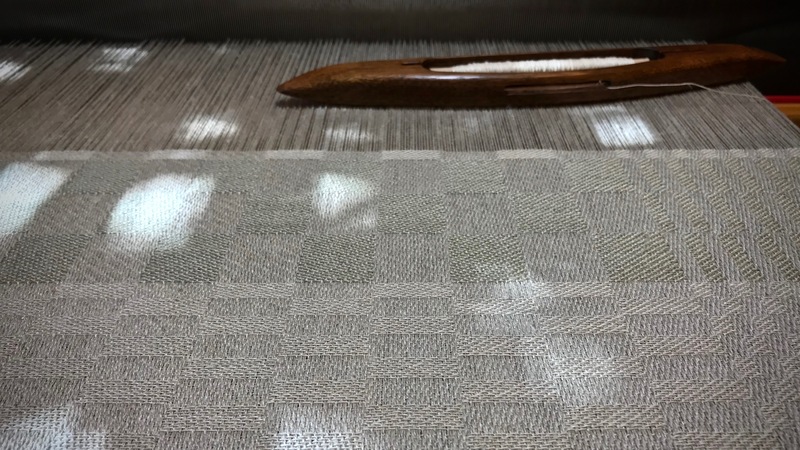 The surprise happened when some of the light made its way under the woven warp and shined up through the cloth, revealing a hidden pattern. Whoa! I discovered a secret passageway in an old majestic house…accidentally! That’s what it felt like. Linen towel in five-shaft satin dräll. Sunlight dances on the woven and not-yet-woven warp. Block pattern on the towel changes, and is emphasized with the change of weft. 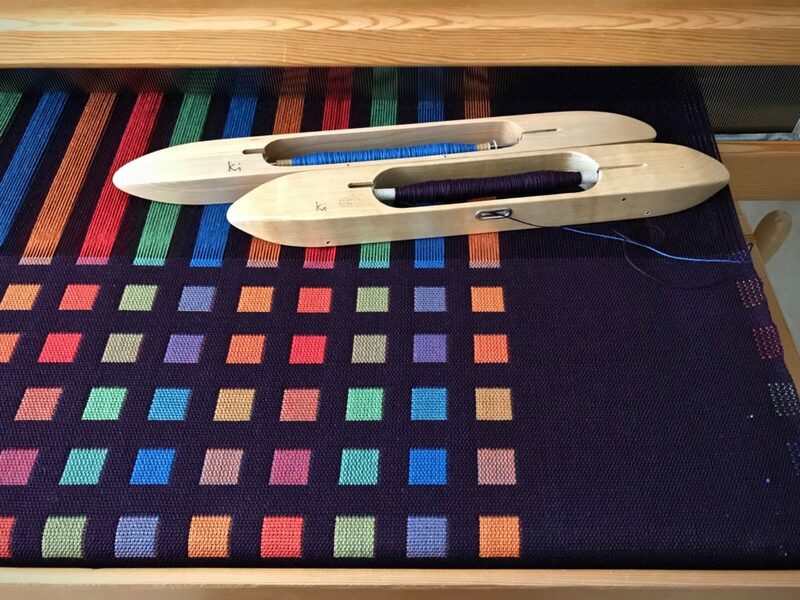 Light comes up through the fabric on the left side of the loom, revealing a hidden structure in the cloth. This is five-shaft satin, not goose-eye twill. How fascinating to get a glimpse of the inner structure of the cloth. 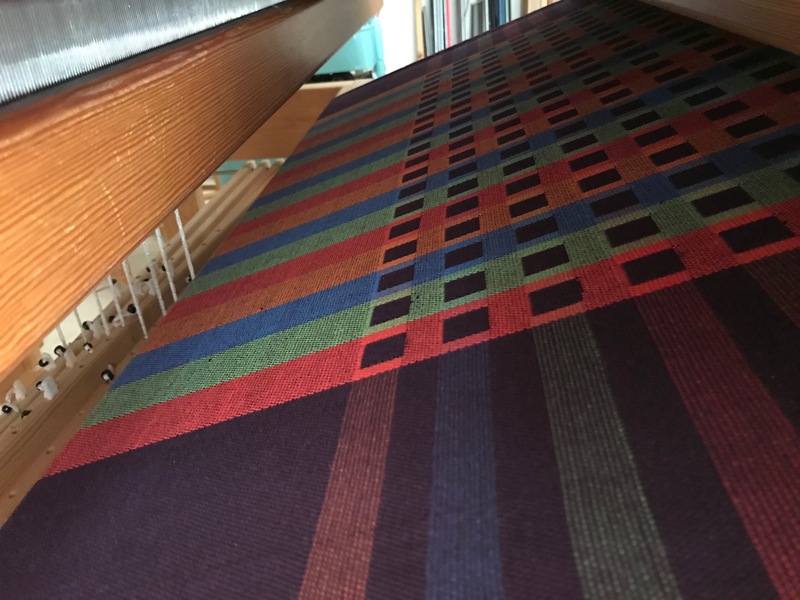 I didn’t expect it, but it does make sense that the treadling pattern is woven into the fabric. But you won’t see it unless light shines through just so. The Lord knows us intimately. He knows what we do and why we do it. Where we go and what our plans and intentions are. He not only knows what we say, he knows the thoughts behind our words. God is not surprised. He knows it all. His light reveals our inner structure. May it be pleasing to Him. May you be pleasantly surprised. Beautiful Karen. What a blessing. Hi Alison, Thanks so much! Very cool! Now I’ll be shining light from the bottom of every weaving. Your work is so very beautiful, Karen. Hi Beth, I know, right? The light from below makes me wonder what I could see on other projects. That is amazing! A reminder that cloth is not always as one dimensional as it may appear upon first glance and neither are any of God’s creations. Your comments about God knowing our inner thoughts, omnipotence, was often a frightening concept to me as a child, but it certainly helped me behave better! Now as an adult, it is more of a comfort, to know someone understands you completely. Hi Annie, So often there is more than meets the eye! I had similar misgivings as a child, thinking about God’s watchful eye. But now, it seems comforting and such an amazing thing to be known by the Creator of the universe. Mother Nature is surely our inspiration! Hi Sara Jeanne, I’m often inspired by beauty I see in nature! Hi Keleen, I am not very familiar with egg candling, but I have heard of it before. It’s interesting how a light source can show what’s inside! God’s light is certainly like that. Wow, way cool! Thanks so much foe Sharing! Hi Teresa, It was mesmerizing to see that pattern in the fabric. I wanted to share it so others could see it, too. I’m delighted that you think it’s way cool like I do! Such inspiring reflections both in nature and in your heart. Thank you! Hi Linda, How sweet for you to take time to leave a touching comment! At the final inches of weavable warp, my regular boat shuttle will not fit through the shed. I wove the first half of this final rug thinking I had more than enough warp left to complete a symmetrical design. 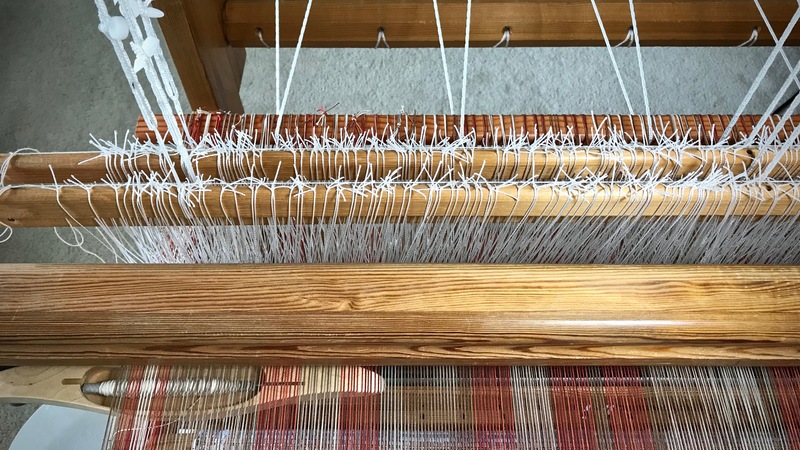 Final rug on this warp. I planned a symmetrical design that reverses at the center of the rug. As the back tie-on bar comes over the back beam I am concerned about whether I have enough warp to finish the second half of the rug. Drama at the end. I still need to weave the ending warp thread header. Time to pull out my secret weapon—a low-profile shuttle. No worries or fretting. 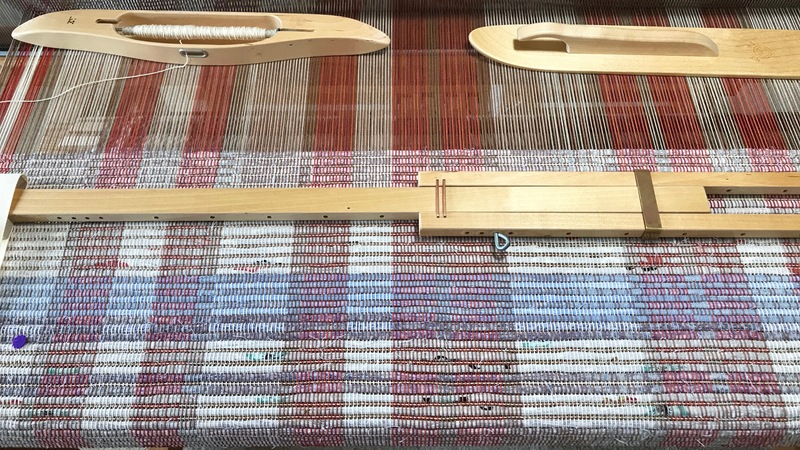 The slim shuttle deftly (with a little prodding) weaves the eight picks of the warp thread header that concludes this final rug. Whew. Low-profile shuttle saves the day. I’m so near the end of the warp that there is not enough room in the shed for my regular boat shuttle to fit through. Very end of the warp is seen right behind the shafts. 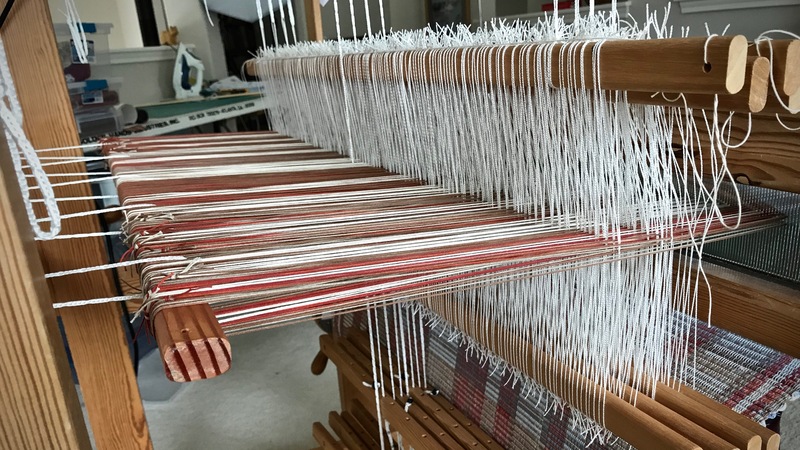 After the eight picks of warp thread header, I wove as many picks of scrap weft as I could…by hand. When we face adversity, and our usual coping methods are not working, we feel the pressure and anxiety. It’s time to activate our secret weapon—a gentle and quiet spirit. Gentleness and quietness are beautiful embellishments to the hidden person of the heart. This humble spirit enables you to glide through the tightest situations. Best of all, those last picks you carefully weave will keep the lovely rag rug you’ve been working on from unraveling. May your heart glow with gratitude. Beautifully said. Thank you and have a wonderful Thanksgiving. I just found you recently and I love reading your blog. Thank you again. Good morning, Letty, I feel like giving you a big hug. You have warmed my heart today. Have a wonderful Thanksgiving, too. Thanksgiving is always a time of reflection on all the wonderful blessings in my life. This year, your Christ centered blog has been added as they are always uplifting as well as informative. Thank you for taking the time to share your thoughts and your work with us. May you and your family have a blessed Thanksgiving, Karen. Good morning, Annie, That means so much to me! It’s a great privilege for me to have friends like you that I can share with. I’m thankful for you. Hi Cindy, It’s really great to have you along! Happy Thanksgiving to you and the family, Karen. This time of year seems to me to be a bit like your end of warp: winding down but with one last stretch needing a little extra thought and care. I’ve got a question for you. I know that you use new cloth for yor rag strips, but do you wash and press it before cutting the strips? Your rugs are sooo beautiful! Hi Joanna, Yes, these few remaining weeks of the year are a testing ground for our gentle and quiet spirits. I do wash and dry the fabric before cutting into strips for weaving. I want to pre-shrink it and rinse out excess dye, so I wash it in hot water and dry it in a hot dryer. I do not press the fabric unless it is too wrinkled to be able to fold it flat for cutting. In that case, just ironing the selvedges is usually enough. I appreciate your kind compliment about my rugs. Weaving rag rugs is one of my greatest pleasures. Wow, that was close to the warp end, wasn’t it, Karen! May all your warps end so well. Happy Thanksgiving to you and your family! Hi D’Anne, Yes, too close for comfort. When will I learn not to overestimate what I have left? I’ve done this too many times. When you get that far, though, you’re determined to make it work. Happy Thanksgiving you and your family, too! Thank you for your insights! I live in Canada, so we have celebrated Thanksgiving about 5 weeks ago. But a reminded to be grateful is always welcome. May yours be full of both Thanks and Giving. Hi Patti from Canada, We do need reminders to be grateful. It’s more important than the celebration of a holiday. Thanks for your kind thoughts. Beautiful post, Karen. Just received the two low profile Hockett shuttles I ordered after reading Handwoven’s article on Finnweave. Glad to have added them to my arsenal. Thank you for the beautiful words. I can always count on you for your words of wisdom. Hi Laurie, I’m sure your new shuttles are beautiful! Yes, it doesn’t hurt to have a low-profile shuttle or two just in case the end of the warp comes a little too soon. 🙂 Of course, these shuttles are also good for proper things like Finnweave and damask weaving. I appreciate your sweet sentiments. Thank you. Our family has been dealing with one adversity after another this year and I really needed to hear those words in particular today. I can’t tell you how many times standing at the loom has been what helps me make it through the next day. Hi Lisa, It’s not easy to face continued difficulties. If I could be a small part of helping you through that, I’m glad. If only I could reach all the way through and give you a hug, I would. There’s always a new day. Hopefully, your trying times will transition to happier times soon. I’m glad you have your loom.